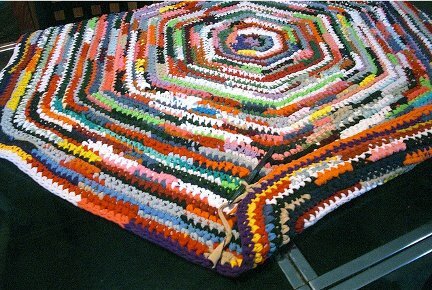 I haven’t made one yet, but I think I will attempt to crochet a rug this winter. I’ll start small, and if it doesn’t drive me crazy i’ll do a bigger one! 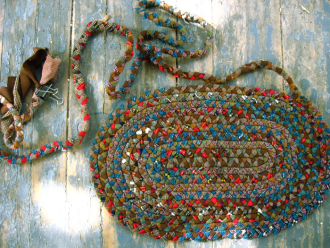 I’ve made a hooked rug, but with yarn, not fabric scraps. It’s fun to be able to make your own design (abstract or geometric or pictorial)! 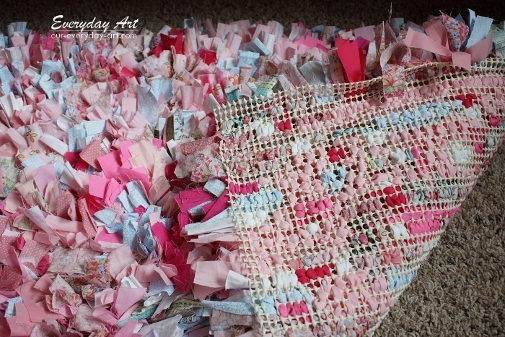 Ive made a crocheted rag rug. I love it the only thing i don’t like is the cutting of the 1″ strips very annoying. But after convincing my husband to help it was a lot better. 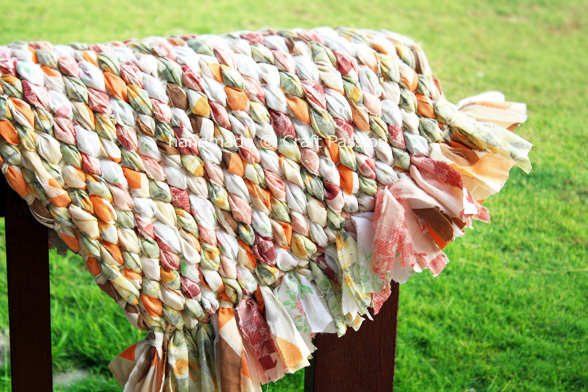 Hi, I’m making a rag rug right now – it’s on a handmade loom. I’ve seen it called twining but I don’t think the technique I’m using is actually twining? Does that make sense? I’m using a technique I found in a craft book. 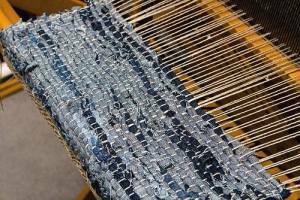 My husband and I made the loom out of strips of wood and lots of nails on the end strips. You can see the technique here: http://ouroldcountrystore.blogspot.com/ The sell the looms if you’re interested. 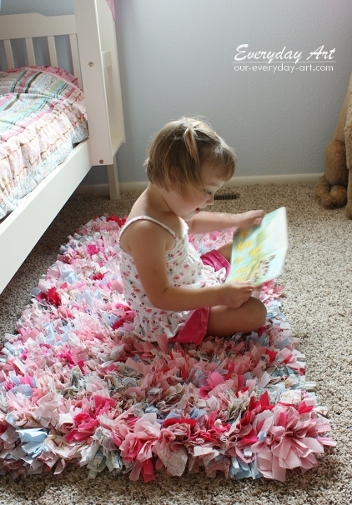 I’d appreciate suggestions for finishing the back of #6 above, the rug with the little girl sitting on it. It was very time consuming but well worth it and it needs a nice backing. I left an edge of about 1 1/2 ” all the way around. Thank you. 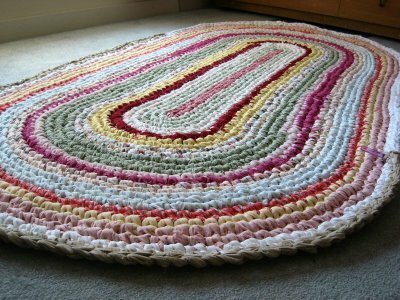 Joy C, here’s a link that might help: http://crafts.creativebug.com/finish-latch-hook-rug-1362.html. Good luck! What they’re calling knotted is what I would call latch-hooked (as would the other Sandra). I’ve made one to my own design, and like the flexibility that is available. 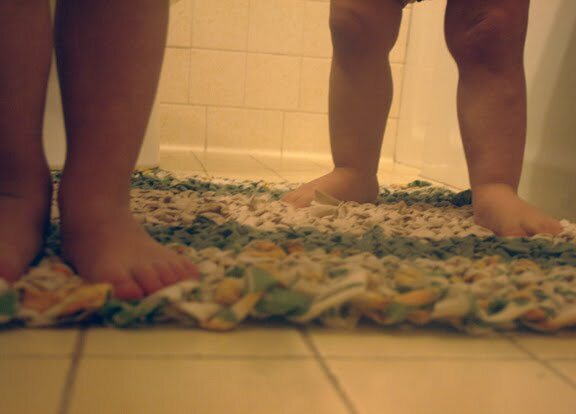 How “puffy” it is would depend on the size of the pieces of fabric you use for each “knot”; you could use narrower than 1×5 rectangles for something more rug-like than the example given. Search quilting websites for hints on cutting strips of fabric for whatever method you end up using – it’s the most fiddly (and boring) part of the process. Thanks for the correction. I made the change in the post. Sheila Palmer, I don’t see why not. Sounds like a great idea.